German scholar and author; born in Trebitsch in 1825; died about 1875. Having acquired a thorough acquaintance with the Hebrew language and literature, Reckendorf devoted himself to the study of the other Semitic languages. In 1856 he went to Leipsic, where he occupied himself with the study of history; later he became lecturer in the University of Heidelberg. Influenced by Eugéne Sue's "Les Mystéres de Paris," Reckendorf planned a similar work in Jewish history. The result of his design appeared in his "Die Geheimnisse der Juden" (5 vols., Leipsic, 1856-57), a collection of sketches from Jewish history, written in German. These, though independent of one another, preserve an unbroken historical sequence covering the whole period from the time when the Jews were exiled by Nebuchadnezzar up to his own time. Reckendorf endeavored especially to show that the line of David never disappeared; that it passed from Zerubbabel, through Hillel and certain Jewish kings in Arabia, and through the Abravanels. His assertions are based on various historical works and on the Talmud, the sources being referred to in footnotes. Abraham Kaplan translated the first part into Hebrew under the title of "Mistere ha-Yehudim" (Warsaw, 1865); later the whole work was freely translated into Hebrew by A. S. Friedberg, under the title of "Zikronot le-Bet Dawid" (ib. 1893). 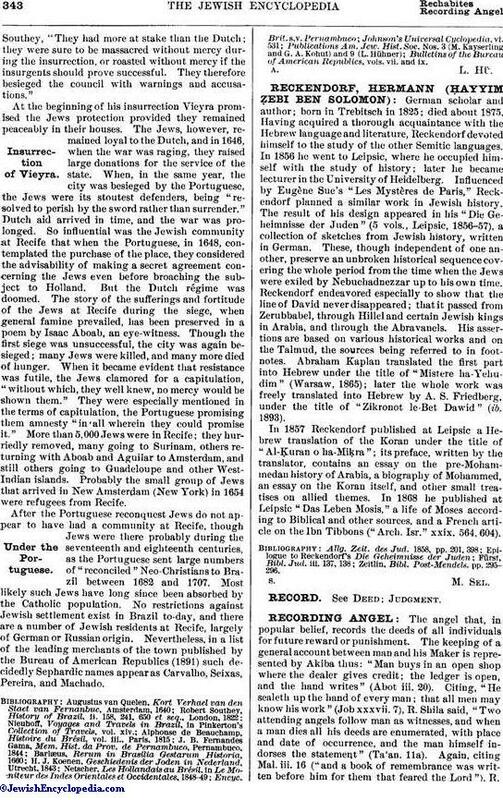 In 1857 Reckendorf published at Leipsic a Hebrew translation of the Koran under the title of "Al-Ḳuran o ha-Miḳra"; its preface, written by the translator, contains an essay on the pre-Mohammedan history of Arabia, a biography of Mohammed, an essay on the Koran itself, and other small treatises on allied themes. In 1868 he published at Leipsic "Das Leben Mosis," a life of Moses according to Biblical and other sources, and a French article on the Ibn Tibbons ("Arch. Isr." xxix. 564, 604). Zeitlin, Bibl. Post-Mendels. pp. 295-296.